KLK - Keyboard Lock. Allows you to prevent unintended keystrokes from altering the settings of SdrDx. Also, clicking this once or twice so that it is not illuminated ensures that the application sees keystrokes. There are some controls, in particular the main frequency readouts, that can "steal" keystrokes, effectively making the program deaf to keyboard commands. This button re-directs keyboard input to the command system when not illuminated. If the program becomes unresponsive to keyboard commands and KLK is illuminated, press KLK once. Otherwise, press KLK twice so that its state is KLK. You can set several features for keyboard locking; →Right-click KLK to access those features. Refer to the picture of the dialog at the right. In Button Only mode, the keyboard is locked when KLK is illuminated, and unlocked otherwise. If Any Button Unlocks is checked, then pressing any button in SdrDx's main panel (except KLK) will unlock the keyboard. If you check Use Timer , once the keyboard is unlocked, when the number of seconds passed that are specified in the Timeout field pass, the keyboard will re-lock automatically. 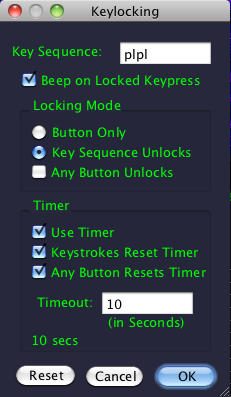 You can check Keystrokes Reset Timer ; if you do, then when the keyboard is unlocked, each time you press a key, the timer is reset. This allows you to operate continuously with the keyboard, but will still lock the keyboard when you have not typed anything for the number of seconds specified. You can check Any Button Resets Timer ; if you do, then when the keyboard is unlocked, each time you press a button on SdrDx's main panel, the timer is reset. This allows you to operate continuously with the keyboard even when you are going back and forth between the keyboard and pressing buttons, but will still lock the keyboard when you have not pressed any button for the number of seconds specified. There are two cases likely when you are entering keystrokes into SdrDx in a locked condition. The first is unintentionally; SdrDx is the active window, but you thought you were entering keystrokes into something else. The second is when you actually want SdrDx to perform the key commands, buy you are unaware that the keyboard is in a locked state. in either case, it can be useful to be notified that you are typing into a locked window, and that is what the Beep on Locked Keypress feature is designed to do. You can exclude any key you like from the general locking mechanism. See Keystroke Lock Exclusion for how to go about that. When you press Cancel, all changes made are discarded and the dialog closes.